Cleanses, Removes Make-Up And Soothes In One Go. 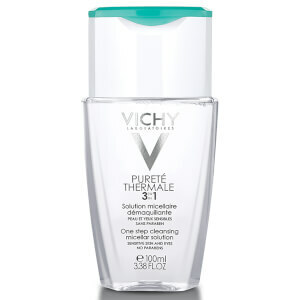 Micellar technology captures impurities to help cleanse and remove make-up from sensitive skin without rubbing or rinsing. Gently cleansed, sensitive skin is perfectly clean with no feeling of discomfort. Water, Hexylene Glycol, Glycerin, Poloxamer 184, Rosa Gallica Flower Extract, Disodium Cocoamphodiacetate, Disodium EDTA, Propylene Glycol, Panthenol, Dihydrocholeth 30, Polyaminopropyl Biguanide, Fragrance.